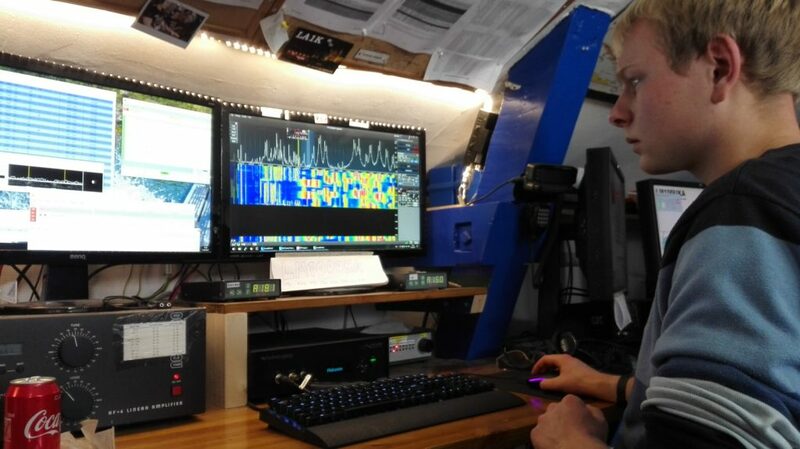 Marie LB1MH and Øyvind LA3WUA working RTTY on 20 m and 15 m, respectively. Samfundet is currently closed down in preparation for UKA. 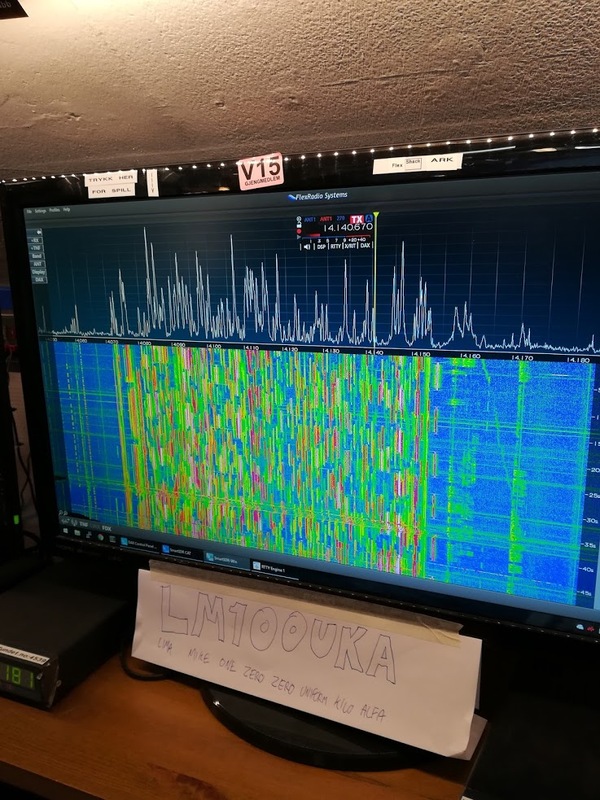 In between the sound checks, rehearsals and other activities that occur in this hectic period, we managed to sneak in some contacts as LM100UKA in the CQ WW RTTY contest. We decided to run as Multi-Two to get the most out of the few timeslots when we could operate. Henrik LB5DH working 20 m on Saturday. 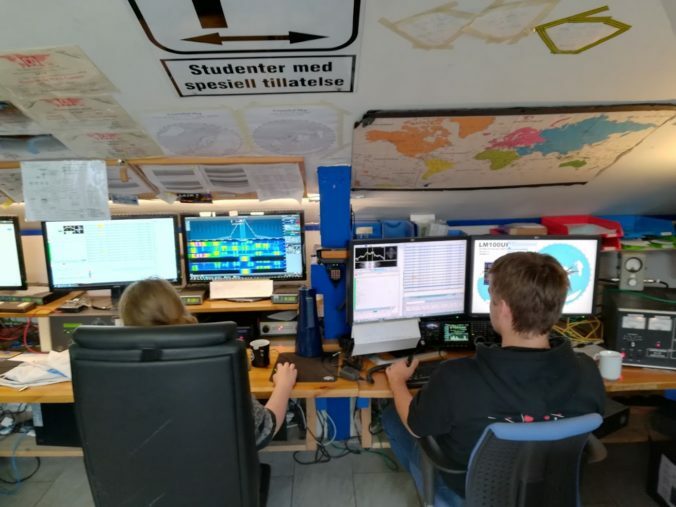 One of the challenges we face when operating in contests from Samfundet is Electro Magnetic Interference (EMI) to the other groups at Samfundet. Particularly when operating legal limit on the low bands, audio and lighting equipment tend to get unwanted interference. Normally we try to locate the weak spots and seal them with ferrites and filters, but during UKA there is a lot of new equipment so it is hard to get to all the problems in time. The solution is often to cooperate with the groups that are responsible for audio and visuals and coordinate so that we do not transmit high power levels on the low bands while they are working. Conditions on 20 m was also good on Sunday. The contest was also our first good test of the Flex 6500 for RTTY. Thanks to the panadapter, finding an open frequency to work was a breeze. It also allowed us to quickly diagnose that we had set the wrong tone spacing (oops). We had a bit of trouble setting up SmartSDR to talk to MMTTY through N1MM+, but in the end we got it working through the help from some good resources online. What was not so great was setting RIT/XIT using mouse and keyboard. Hopefully our Maestro will arrive soon to address this problem. QSOs per hour. Orange: 15 m, Red: 20 m and Blue: 40 m.
The QSO-rate was largely influenced by when we had a chance to operate in between different sound checks. 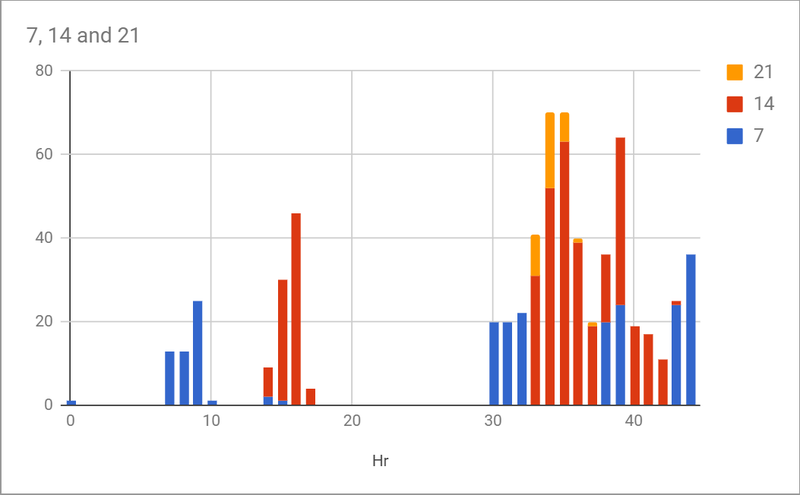 As the graph shows, this was mostly during the afternoon on Sunday. Conditions were ok, but only one band was significantly open at a given time, typically either 20 m or 40 m.
We got 657 QSOs and 107 mults over the weekend. A good result considering the operating conditions, both on the air and at Samfundet. Thanks to LB5QG, LB1MH, LB5DH, LB7JG and LA3WUA for their operating efforts.